Come have a fun and enlightening experience with yoga, baby goats and Mother Nature. We will be returning with our Tivoli Village Evening Classes every Monday at 6pm starting April 1st. Join us Saturdays at 1130am for indoor sessions at the Henderson Multigenerational Center. Perfect for bachelorettes, birthdays, corporate events and team building. 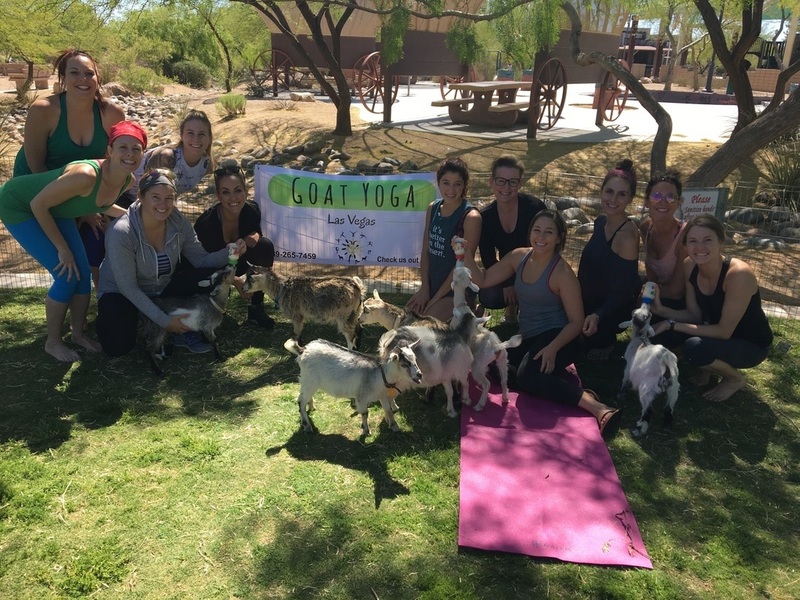 Purchase a Goat Yoga Las Vegas Gift Certificate for someone close to you. A $35 value includes 1 class and mat rental. Good for 1 year after purchase. ​Check out our NEW Goat Yoga Las Vegas Hoodies and other merchandise now for sale at class or our online store! Now partnered with MindBody® you can create an account with Goat Yoga Las Vegas and save your reservations. No more looking for your confirmation emails! Like us on Facebook - Follow us on Instagram - Email us with any questions.